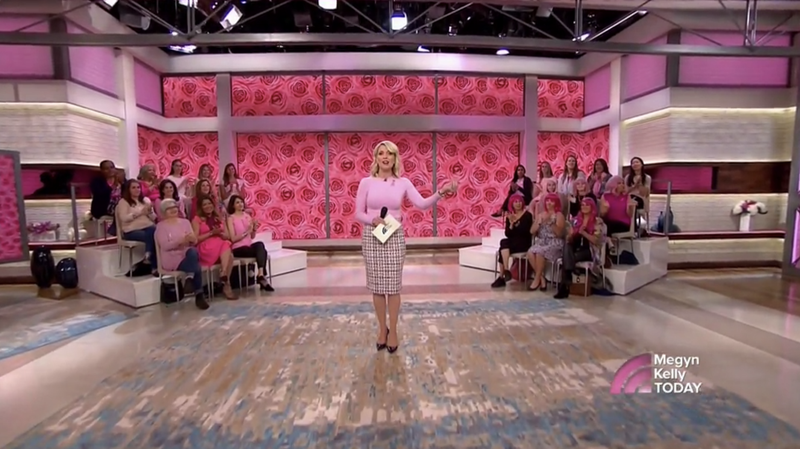 Megyn Kelly walked onstage in a pink top, as today’s episode is about Breast Cancer Awareness Month. Bobby Finger noticed that the town hall-like setup introduced yesterday was back, and that putting audience members behind Megyn Kelly sort of warms the place up. Megyn Kelly spoke briefly about the Las Vegas attack, specifically about two men who died saving the lives of strangers. Megyn Kelly talked about a new app called “Class Dojo” that lets parents check in on how their children are doing at school. Megyn Kelly got some laughs from the audience. Megyn Kelly and Hoda Kotb, a breast cancer survivor, discussed how they have the same oncologist. Megyn reveals she “had a scare” some time ago. Megyn Kelly cut to commercial and teased an interview with Elizabeth Hurley. Megyn Kelly cut to tape of her speaking with Elizabeth Hurley about Estée Lauder’s campaign for breast cancer awareness. Elizabeth Hurley revealed that her grandmother found a lump herself and didn’t tell doctors for over a year because she was embarrassed. Megyn Kelly asked Elizabeth Hurley about Julia Louis-Dreyfus’s breast cancer announcement. Megyn Kelly welcomed journalist/TV host Joan Lunden to her set after the break. Joan Lunden walked onstage in hot pink and everyone went nuts. Joan Lunden explained that every woman should give themselves self-exams. Joan Lunden explained that you need ultrasounds for dense breasts, and that the ultrasounds are what caught her cancer and kept her alive. Megyn Kelly teased the next segment, during which Joan Lunden will take questions from the audience. We cut to a taped segment about two women—Alexis, a single mother who was diagnosed with breast cancer while caring for her baby girl Lexi, and Heather, who adopted Lexi after Alexis’s death. Heather revealed that she found a lump in her own breast a year and a half after Alexis’s death. Heather began working with Pink Ribbon Girls, an organization that helps support women with breast cancer by providing family meals, house cleaning, and transportation to treatment. She is now President and CEO of Pink Ribbon Girls. Megyn Kelly revealed her show would be donating $10,000 to Pink Ribbon Girls. Megyn Kelly introduced Dr. Evelyn Minaya, who explained how to do a self-exam. Joan Lunden warned the audience of looking things up on the internet. Megyn Kelly welcomed Hoda and Kathie Lee to the stage screen. Megyn Kelly surprised a breast cancer survivor named Paula by revealing she would get to meet Hoda and Kathie Lee and get a mini makeover.